Charles J. and Emma K. were enumerated in the 1900 West Suffield Village, Suffield Twp., Hartford Co., CT, federal census. He was a farmer age 38, she was 27. Children in the household were Chester H. 7, Burton K. 6, Marjorie 4, Henry V. 2, and Charles J. 1. Charles J. and Emma were enumerated in the 1930 Granby census, pagae 8B. He was a farmer age 67, she was 60. There was no one else in the household. [S25] Hannah McPherson, Holcombe Genealogy, page 105.1/Item A-8-1-1-3-7-3-2-5. [S818] Edwin W. Strickland II, William Buel, 8-14, page 485. 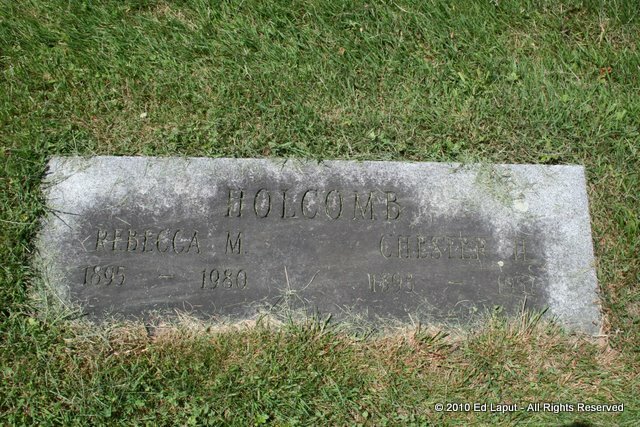 [S807] Find A Grave, online http://www.findagrave.com, Find A Grave, database and images (https://www.findagrave.com : accessed 23 March 2019), memorial page for Charles Joseph Holcomb (Oct 1863–1939), Find A Grave Memorial no. 88062250, citing West Suffield Cemetery, Suffield, Hartford County, Connecticut, USA ; Maintained by c.walker (contributor 47554717) . The Roberts Reunion Association prepared a supplement in August 1987. [S25] Hannah McPherson, Holcombe Genealogy, Page 105.1/Item A-8-1-1-3-7-3-2-6. [S807] Find A Grave, online http://www.findagrave.com, memorial ID 79382745. Addie May Holcombe was born on 4 May 1870 at East Hartland, CT.2 She was the daughter of Harvey H. Holcombe and Maria Louisa Roberts.3 Addie May Holcombe married John Hoyt Bean II, son of John Hoyt Bean and Lucy M. C. Austin, on 17 September 1889.2 Addie May Holcombe died in 1943. John and Addie were enumerated in the 1930 East Granby, Hartford Co., CT, federal census. He was a laborer, age 51, she was 49. There were no children in the family. [S25] Hannah McPherson, Holcombe Genealogy, Page 105.2/Item A-8-1-1-3-7-3-2-7. Amos Roberts Holcombe was also known as Robert J. Holcombe.2 He was born on 4 January 1875 at East Hartland, CT.3,4 He was the son of Harvey H. Holcombe and Maria Louisa Roberts.5 Amos Roberts Holcombe married Ida Belle Cook on 14 June 1900 at East Granby, Hartford Co., CT. Amos Roberts Holcombe died on 1 March 1934 at East Granby, Hartford Co., CT, at age 59. He was buried on 3 March 1934 at West Suffield, Hartford Co., CT.
McPherson gives his birth date as 1857, but lists him after siblings born in 1870 - probably a typo, his census records would also indicate a birthdate of 1875. Seth Holcombe found most of this information in a book Genealogy of the Family of William Watson Roberts and Nancy Hoyt (Bean) Roberts. Robert was enumerated in the 1900 Suffield, Hartford Co., CT, federal census. He was a farmer age 25. His mother M. Louise, widowed age 67, was keeping house. Amos is listed in the 1920 East Granby census, page 3A, line 17, age 45, a farmer, with wife Ida M., and children Nancy G., Amos R., Donald M., Ralph P., and Irving L.
Amos and Ida were enumerated in the 1930 East Granby, Hartford Co., CT, federal census, district 112. He was a farmer, age 55, she was 44. Children in the household were Ralph 21, Donald 25, and Irving 16. A. Robert Holcomb, 59, born in Hartland, son of Harvey and Maria Holcomb, died early Thursday morning of heart trouble. Although he had been in ill health for some time, Mr. Holcomb had been confined to his home for only a few weeks. Mr. and Mrs. Holcomb came from West Suffield to Copper Hill, East Granby, 21 years ago. Mr. Holcomb had been active in town affairs having served for several years as firs selectman, assessor, and on the Board of Relief. He leaves his wife, Mrs. Ida Belle (Cook) Holcombe, a daughter, Mrs. Own Johnson of Hartford, four sons, Amos and Ralph of East Granby, Irving of Southwick, Mass., and Donald of Hartford; four grandchildren; a brother, Charles J. Holcomb, of Granby; and two sisters, Mrs. Cyrus Tripp, of Granville, Mass., and Mrs. John Bean of Springfield, Mass. The funeral will be Saturday at 2 p.m. at the Harold M. Hayes funeral home in North Granby. Rev. Harold I. Zook of the Copper Hill Congregational Church will officiate. Burial will be in West Suffield Cemetery. [S25] Hannah McPherson, Holcombe Genealogy, Page 105.2/Item A-8-1-1-3-7-3-2-8. [S606] Richard C. Roberts, Roberts Reunion 4, page 72. Cyrus Horatio King was born on 30 March 1833 at Suffield, Hartford Co., CT. He was the son of Artemus King and Sophia Granger. Cyrus Horatio King married Sarah Ruic Case, daughter of Chester Case and Rhoda Ruic, on 23 November 1863. Cyrus Horatio King died on 14 January 1885 at Suffield, Hartford Co., CT, at age 51. Artemus King was born on 12 June 1799 at Suffield, Hartford Co., CT. He was the son of Theodore King and Sibble Hanchett. Artemus King married Sophia Granger, daughter of Roderick Granger and Amanda Dunlap, on 12 January 1825 at Suffield, Hartford Co., CT.1 Artemus King died on 14 March 1881 at Suffield, Hartford Co., CT, at age 81. Artemas King was an active and prominent man in Suffield. He was highly respected and a man of superior intelligence and judgment, always holding some important town office until he had passed the age of 70. He was consulted on most of the important affairs of the town and many times people from adjoining towns sought his advice. In his early days. He was Capt. of the Militia " Old Guard" and for many years Justice of the peace. In 1868 when he was 69 he notified the town that owing to the approaching age limit of 70 years they must not elect him again as he no longer would serve again. They then elected him Representative and he served two terms in the Legislature at New Haven and Hartford, CT.
Artemas and his brother Theodore inherited a large tract of land from their father who was the largest land owner in Suffield. They afterwards punched the Harmon farm of many acres adjoining their tract. Theodore died in 1857 leaving his share to Horace A King the eldest son of Artemas. After the death of Horace in 1869 Artemas purchased the estate from the heirs and became sole owner, and on his death, he left the property to his children. About 2 years after Artemis died the old homestead burned destroying many valuable records and relics among which was the gun used by his father in the Revolutionary War. Theodore King was born on 21 December 1750 at Suffield, Hartford Co., CT. He was the son of Capt. Joseph King. Theodore King married Sibble Hanchett on 28 June 1792 at Suffield, Hartford Co., CT. Theodore King died on 8 September 1822 at Suffield, Hartford Co., CT, at age 71. Capt. Joseph King was the son of James King. James King was the son of William King. Sarah Katherine Holcombe was also known as Catherine Sarah Holcombe.1 She was born on 15 December 1891 at East Hartland, CT. She was the daughter of Charles Joseph Holcombe and Edith Sarah King.1,2 Sarah Katherine Holcombe died on 21 November 1896 at age 4. The 1971 Roberts genealogy indicates she was born 15 December 1890 in East Hartland, Ct. and died 21 November 1896 in West Suffield, Ct., The Holcomb Genealogy says she was b. 15 December 1891 and d. 21 November 1896. Although records at the Connecticut State Library suggest that she is buried in the Holcomb Cemetery, Hartland, her stone is in West Suffield Cemetery. It states that she d. 15 Dec 1890 at age 5 yrs. 11 mos. Chester Harvey Holcombe was born on 1 February 1893 at East Hartland, Hartford Co., CT.1,2,3 He was the son of Charles Joseph Holcombe and Edith Sarah King.4,5 Chester Harvey Holcombe married Rebecca Mary Phelps, daughter of Drayton Canfield Phelps and Roxie Caroline Pearce, on 18 March 1915 at Edgerton, OH. Chester Harvey Holcombe died on 27 November 1957 at West Suffield, Hartford Co., CT, at age 64; at the home of daughter Edith.2 He was buried on 30 November 1957 at Copper Hill Cemetery, East Granby, Hartford Co., CT.
Information on Chester Harvey Holcombe and his family is from Seth Holcombe of the Salmon Brook Historical Society. The 1920 census of East Granby, page 3A, line 25, shows Chester H. Holcomb, age 26, a farmer. Living with him were wife Rebecca, children Draton, and Edith, brother Harold, and sister-in-law Gerturde Phelps. Chester H. and Rebecca were enumerated in the 1930 Granby census, page 6B. He was a farmer, age 37, she was 35. Children in the household were Drayton age 14, Edith age 11, Carlton age 10, and Katherine age 6. Chester was a dairy and tobacco farmer and liked to hunt and fish. Rebecca was a homemaker and practical nurse. Chester registered for the WWII draft while he was living in Bradenton, FL. He listed Edith Holcombe of West Suffield, CT, as his closest relative. Burton King Holcombe was born on 22 February 1894 at West Suffield, Hartford Co., CT.1,2,3 He was the son of Charles Joseph Holcombe and Edith Sarah King.4,5 Burton King Holcombe married Maude L. Lauzon, daughter of Fredrick Lauzon and Ella Agusta Holcombe, on 17 August 1916 at West Suffield, Hartford Co., CT.6 Burton King Holcombe died on 8 July 1982 at Hartford, Hartford Co., CT, at age 88.3,6 He was buried at West Suffield, Hartford Co., CT.
Burton and Maude were enumerated in the 1920 Suffield, Hartford Co., CT, federal census, ED 190, page 4B. He was 25, Maude was 23. Madeline was the only child in the household. Burton and Maude were enumerated in the 1930 Suffield, Hartford Co., CT, federal census, district 217. He was a farmer, age 36, she was 33. Madeline was 12, Kenneth was not yet 1. Burton registered for the WWII draft and was living in West Suffield and he listed Maude as his closest relative. The Roberts Genealogy lists his birth date as 21 February, the SSDI lists his birth day as 21 February. The WWI draft registratioin lists 22 February; the WW II draft Registration of 1942 lists 22 February. [S182] Social Security Death Index (on-line), Ancestry.com, SSDI, Ancestry.com, SSAN 016-12-8835. [S606] Richard C. Roberts, Roberts Reunion 4, page 76. [S182] Social Security Death Index (on-line), Ancestry.com, SSDI, Ancestry.com, SSAN 048-03-7000. Henry Valentine Holcombe was born on 14 February 1898 at West Suffield, Hartford Co., CT. He was the son of Charles Joseph Holcombe and Edith Sarah King.2 Henry Valentine Holcombe married Edith Gertrude Roberts, daughter of William Warren Roberts and Gertrude Hill, in May 1920 at Springfield, Hampden Co., MA. Henry Valentine Holcombe married Hilda Jeannette Whipple, daughter of Arthur Garfield Whipple and Mary Curtiss, on 24 April 1924 at Simsbury, Hartford Co., CT. Henry Valentine Holcombe married Amy Louise Tolx on 23 August 1956 at Glastonbury, Hartford Co., CT.3 Henry Valentine Holcombe died on 4 August 1972 at Bradenton, FL, at age 74. He was buried at Granby, Hartford Co., CT.
At the time of his registration for the WWI draft, Henry was working for his brother Chester. Henry and Hilda were enumerated in the 1930 Granby census, page 9A. He was a farm laborer age 32, she was 22. Children in the household were Harold 7, Henry Jr. 4 years 7 months, and Grace 3 years 8 months. Henry V. and Jeanette were again enumerated in Granby in the 1940 census. He was a farmer, age 42, she was 33. Children in the household were Harold 17, Henry Jr. 14, Grace 13, and Gordon 3. [S180] Compiled by Richard C. Roberts, Roberts Reunion, Page 23/Item A18. The Roberts Reunion reports his birth year as 1900.2,3 He was the son of Charles Joseph Holcombe and Edith Sarah King.4 Charles Joseph Holcombe Jr. married Irene Cordelia Andrews, daughter of Harry Andrews and Lillian May Case, on 26 July 1926. Charles Joseph Holcombe Jr. died on 1 April 1995 at Meadowbrook Nursing Home, Granby, Hartford Co., CT, at age 95.3 He was buried on 4 April 1995 at Elmwood Cemetery, East Granby, Hartford Co., CT.
Charles and Irene were 5th cousins. Charles and Irene were enumerated in the 1930 Granby census, page 7A, living next door to his brother Chester. He was listed as 28, she was 23. He was 24 when married. Apparently, there is no consensus on his birth date. Mildred was also in the household, age 3 years 3 months. The Courant reports in its obituary that Charles was a dairy/tobacco farmer for many years in Copper Hill. After retiring, he was employed at the Copper Hill Golf Course as greens keeper. At the time he filled out his draft registration he reported he was working for C.H. Holcombe, apparently his brother Chester. [S180] Compiled by Richard C. Roberts, Roberts Reunion, Page 24/Item A19. [S182] Social Security Death Index (on-line), Ancestry.com, SSDI, Ancestry.com, SSAN 047-30-3767. Harold and Bessie were enumerated in the 1930 Suffield, Hartford Co., CT, federal census, district 217. He was 26, she was 27. There was no one else in the household. [S180] Compiled by Richard C. Roberts, Roberts Reunion, Page 24/Item A20. [S182] Social Security Death Index (on-line), Ancestry.com, SSDI, Ancestry.com, SSAN 045-09-7529. [S818] Edwin W. Strickland II, William Buel, 8-14, page 540. Ida Belle Cook was born on 21 December 1884 at Cornwall, Litchfield Co., CT. She married Amos Roberts Holcombe, son of Harvey H. Holcombe and Maria Louisa Roberts, on 14 June 1900 at East Granby, Hartford Co., CT. Ida Belle Cook died on 25 February 1968 at Thomaston, Litchfield Co., CT, at age 83.1 She was buried at West Suffield, Hartford Co., CT.
Owen E. and Nancy G. were enumerated in the 1930 Hartford, Hartford Co., CT, federal census, District 74. He was a salesman for a milk dealer, age 30, she was 28. Children in the household were Doris O. 8, and Norma O. 6. [S180] Compiled by Richard C. Roberts, Roberts Reunion, Page 28/Item A29. Amos Roberts Holcombe Jr. was born on 31 October 1903 at West Suffield, Hartford Co., CT.2 He was the son of Amos Roberts Holcombe and Ida Belle Cook. Amos Roberts Holcombe Jr. married Evelyn Corrine Hansen on 15 October 1927 at Granville, Hampden Co., MA. Amos Roberts Holcombe Jr. died on 24 October 1980 at Westfield, Hampden Co., MA, at age 76. Amos and Evelyn were enumerated in the 1930 East Granby, Hartford Co., CT, federal census, district 112, on the same page as his parents. He was a farm laborer, age 26, she was 23. The SSDI and Massachusetts Death Records both agree on a death date of 31 Oct 1903, Roberts Reunion records, Page 29/Item A30 indicate 31 Dec 1902. [S180] Compiled by Richard C. Roberts, Roberts Reunion, Page 29/Item A30. [S182] Social Security Death Index (on-line), Ancestry.com, SSDI, Ancestry.com, SSAN 043-30-2981. A union carpenter and one of the original members of the East Granby Volunteer fire Department (obituary). [S180] Compiled by Richard C. Roberts, Roberts Reunion, Page 29/Item A31. 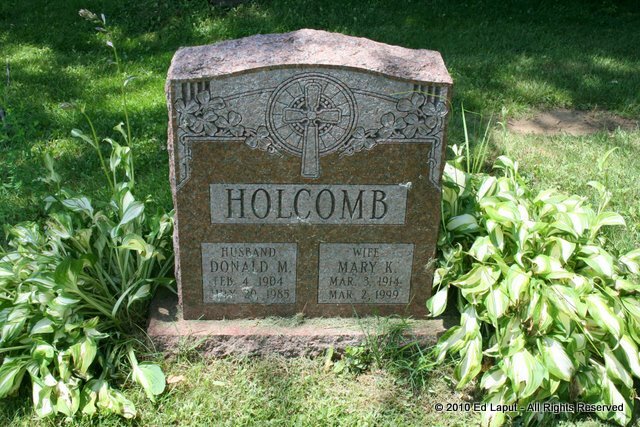 Mildred Louise Holcombe was born on 23 September 1905 at West Suffield, Hartford Co., CT. She died on 24 September 1905 at West Suffield, Hartford Co., CT. She was the daughter of Amos Roberts Holcombe and Ida Belle Cook. Ralph Phillips Holcombe was born on 28 June 1908 at West Suffield, Hartford Co., CT. He was the son of Amos Roberts Holcombe and Ida Belle Cook. Ralph Phillips Holcombe married Gertrude H. Demski, daughter of August Demski and Augusta F. (?). Ralph Phillips Holcombe died on 7 November 1960 at Hartford, Hartford Co., CT, at age 52.2 He was buried at Collinsville Village Cemetery, Collinsville, Hartford Co., CT.
Ralph and Gertrude had no children. [S182] Social Security Death Index (on-line), Ancestry.com, SSDI, Ancestry.com, SSAN 046-07-9021. Clarence Emerson Holcombe was born on 11 March 1911 at West Suffield, Hartford Co., CT. He was the son of Amos Roberts Holcombe and Ida Belle Cook. Clarence Emerson Holcombe died on 22 March 1911 at West Suffield, Hartford Co., CT.
Martha A. Wilder was born circa 1835 at VT.1,2 She married Charles A. Holcombe, son of Asa Holcombe II and Ada Strickland. George Holcombe was born in October 1856. He was the son of Charles A. Holcombe and Martha A. Wilder. Henry Holcombe was born circa 1858 at MA.1 He was the son of Charles A. Holcombe and Martha A. Wilder. Ellen Holcombe was also known as Nellie Holcombe. She was born in August 1861 at MA.1 She was the daughter of Charles A. Holcombe and Martha A. Wilder. James William Holcombe was born circa 1863 at MA.1 He was the son of Charles A. Holcombe and Martha A. Wilder. James William Holcombe died young. Joseph Drake was the son of Joseph Drake and Elizabeth Cook.1 Joseph Drake married Harriet Holcombe, daughter of Asa Holcombe and Chloe Dibble; no children.1 Joseph Drake died on 7 October 1836. Margaret Holcombe was also known as Peggy Holcombe.1 She was born on 5 January 1780.2 She was the daughter of Nathaniel Holcombe V and Hannah Holcombe. Margaret Holcombe married Lorenzo Dow, son of Humphrey Bean Dow and Tabitha Parker, on 4 September 1804 at NY. Margaret Holcombe died on 6 January 1820 at Tuberculosis at age 40. Lorenzo early in life became an enthusiastic missionary and evangelical preacher, traveling far and wide into the cities, countrysides, frontiers, wildernesses and among the Indians in New England, the Canadian border, NY State and North Atlantic seaboard and its interior preaching incessantly to the extent of this frail physical power. He made a challenging appeal wherever he went. The originality of his doctrines and philosophies, his novel expressions in presenting Christianity, in connection with his most unusual abilities and personality arrested the attention of all classes hearing him until his reputation spread rapidly to most American frontier settlements as well as to the British Isles and beyond. For one of these appointments to preach he came to one of the NY State communities where Peggy was living in the home of her oldest sister, Hannah and husband and finally lodged, at least, for a meal with them. While there, - out of her presence, - he inquired of her religious attitude. Upon learning of her interest in the spread of Christianity, he soon mentioned to her consideration of their marriage, but made clear to her that he could not relax his missionary work to remain home with a family, saying that she should have two years to consider the sacrifices such a life would impose upon her, before accepting, as he could not accompany him on much of his evangelistic touring. Within those two years they were married. Peggy did not see him for months at a time, - occasionally as much as nearly a year. In efforts to be with him she did make many long, burdensome trips, - by horseback, on river boats, ocean sailing boats and other uncomfortable and dangerous means of travel. Lorenzo and Peggy sailed 10 Nov 1805 from New York City for Liverpool, England. He next preached in England and Ireland for eighteen months. Within the first few months after Letitia was born, Peggy became so ill that the infant was found a nurse in the country and after long weeks she was convalescent enough to be also carried to the country nearer the nurse and had the baby brought to see her. It soon died before Peggy saw it again and was buried at Warrington. After eighteen months abroad they sailed for America, May 6, 1807. Upon landing they soon toured together again, - from the home of Lorenzo's father in Vermont, through Westmoreland, Albany, NY State, New York city meeting appointments for preaching at meetings extending southwesterly across PA, NJ, into VA with stops at Winchester and Staunton, VA, WV, and down the Ohio River on a freight boat which would not take Lorenzo's team. He had to drive it overland to Natchez, Miss. Ter., she following by boat as a loan woman passenger, to Natchez. After a long stay amid the disease, danger and alarm there, they road together horseback to Georgia through wilderness in Mississippi, Alabama and Georgia, sleeping by campfire in the open at nights, settlements being more than a day's journey apart, -often enduring severe weather. Continuing northward they were in North Carolina, South Carolina, and Virginia, Lorenzo preaching all the while wherever an audience was found until they came again to Lorenzo's father's home in VT. Peggy kept a diary, at least from 9 Jan 1813 to 27 Jul 1818 which was published as a supplement to her book The Vicissitudes of Life in the Wilderness. Compiler has found nothing as to her opportunities for an education. The writings she left show a brilliant mind, unbounding faith and trust in her Creator, thorough accord with her husband's zeal for the souls of people and her noble principles of character and willingness to sacrifice and endure all hardships to advance Christianity. The mutual devotion of husband and wife was so singularly perfect between them as to excite the highest admiration for the sincerity of their Christianity in foregoing more constant companionship for its promotion. The University of North Carolina at Chapel Hill also has an online biography at: Documenting the American South. Lorenzo Dow was born on 16 October 1777 at Coventry, Tolland Co., CT. He was the son of Humphrey Bean Dow and Tabitha Parker.2 Lorenzo Dow married Margaret Holcombe, daughter of Nathaniel Holcombe V and Hannah Holcombe, on 4 September 1804 at NY. Lorenzo Dow married Lucy Dolbeare, daughter of George B. Dolbeare.1 Lorenzo Dow died on 2 February 1834 at Alexandria, Alexandria Co, VA, at age 56.1 He was buried at Oak Hill Cemetery, Washington, DC; plot West 894 1/2. [S451] Robert Piercy Dow, Dow, Page 505. [S451] Robert Piercy Dow, Dow, Page 500. Adonijah Holcombe II was born circa 1784 at CT.3 He was the son of Adonijah Holcombe and Charity Gillett. Adonijah Holcombe II married Betsey Hillyer, daughter of Daniel Hillyer and Elizabeth Dibble. Adonijah Holcombe II died on 14 February 1860. He was buried on 16 February 1860 at New Ohio Cemetery, North Colesville, Broome Co., NY. Adonijah and Betsey were enumerated in the 1850 federal census of Colesville, Broome Co., NY He was a farmer age 66, she was 64.. Adonijah Jr. age 11 was in the household as was Orson. Is Adonijah Jr. a son or grandson? Census records would indicate that all of Betsey and Adonijah's children were born in NY. 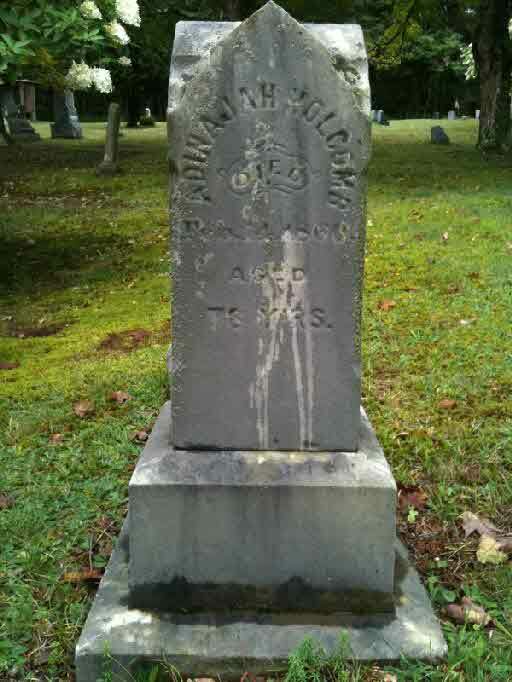 This is probably the Adonijah buried in the New Ohio Cemetery, Broome Co., NY, died 14 Feb 1860, age 74. [S25] Hannah McPherson, Holcombe Genealogy, Page 103.2/Item A-8-1-1-2-7-1. Robert Holcombe was the son of Adonijah Holcombe and Charity Gillett. Cyprian is recorded in the 1850 census of Colesville, NY as a farmer. He was 52, Almira 49, Almina 19, Elmira 15, Ritchnew 8. Cyprian and Almira were recorded in the 1855 Colesville, Broome Co., NY, state census. He was a farmer, age 57, she was 52. The only child in the household was Vicum 14. Cyprian was enumerated in the 1860 Colesville, Broome Co., NY, federal census, page 2. He was a farmer age 62; Almira was 59. Also in the household was son Ritchnew, age 18. [S25] Hannah McPherson, Holcombe Genealogy, Page 104.1/Item A-8-1-1-2-7-9. [S45] Albert C. Bates, Simsbury, Page 284. Fred Page was the son of James Henry Page and Fannie T. Holcombe. Frances Page was the daughter of James Henry Page and Fannie T. Holcombe. Frances Page lived at Portland Heights, Portland, OR.